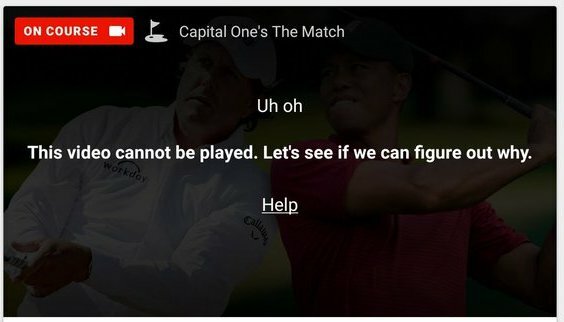 What is being billed as the first ever live PPV event for golf is going down in flames as Bleacher Report’s live stream of the Tiger Woods vs. Phil Mickelson match is experiencing massive failure. The stream, which costs $19.99 to watch, is having a long list of authentication issues, app problems and missing audio amongst other complaints. From what I can tell so far, the issues all appear to be on the front-end and not with the CDNs delivering the video as you can’t even get to the video to watch it. Whichever vendors(s) are responsible for the failures are costing Bleacher Report a lot of money and will need to issue massive refunds. – Stream is not working at all on smart phone or Roku! While Bleacher Report is using many third-party vendors for this failed webcast, that’s no excuse for the company to not even acknowledge the problems they are having. Two hours into the problems they haven’t posted a single Tweet updating users and many are leaving comments that the support number provided is busy and they can’t get through. I also haven’t seen Bleacher Report reply to a single user and their strategy of just ignoring the problem is about as bad as you can get. Making matters worse, all week Bleacher Report has been promoting the event on social media saying “Because watching live sports should be easy”. Ouch. But this is what happens when you don’t plan properly, don’t use vendors that know how to execute large scale webcasts properly and have a failover strategy. This PPV webcast now equals the MacGregor/Mayweather PPV from a disaster stand-point.